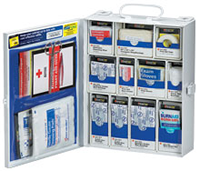 This 201-piece, 27+ unit restaurant first aid kit with metal case is well equipped to handle the burns and other minor injuries common to restaurant workers and patrons. Each kit includes a variety of bandages, compresses, tablets, eye care and burn relief products, along with one Rescue Breather CPR one-way valve faceshield. Bulk Discount, purchase 6 at only $52.95 each!! Bulk Discount, purchase 4 at only $56.62 each! This 254-piece food service kit is ideal for restaurants, deli's, or any food service establishment. The swing-out door and easy-to-carry handle add extra convenience. This unique cabinet design eliminates disorganized and missing supplies. Clearly labeled compartments create a cabinet that is easy to use and restock. With the expansion pocket, you can customize your cabinet to meet your specific needs.